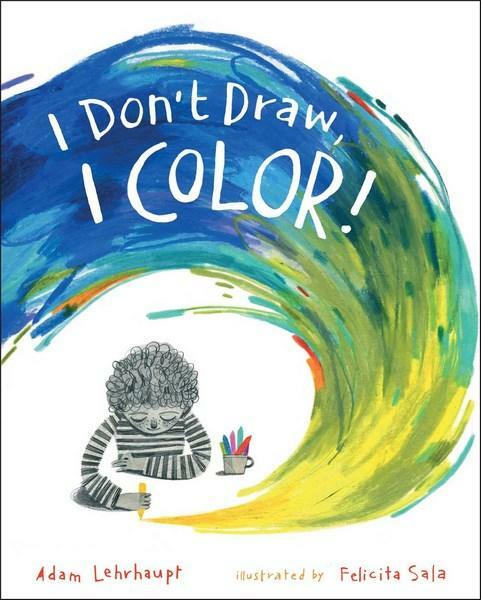 Kids' Book Review: Review: I Don't Draw, I Color! Review: I Don't Draw, I Color! Some people have a real flair for drawing, but the main character in I Don't Draw, I Color! believes he is not one of those people. But that's okay, he doesn't mind, because instead of drawing, he colours. 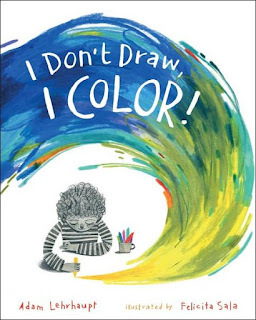 Through funky splashes of scribbles, this book explores how emotions, concepts and stories can all be represented with colours alone—no pictures required. Angry and scratchy red, calm and flowing purple, bright and flashy yellow parade the pages. Our hero shows off his colouring talent, and at the end of the story, he brings it all together in a colourful masterpiece. With lots of white space and bold illustrations in a marvellous scribbly style, the beautiful, messy pictures will remind you and your kids of their own art. And with that idea in mind, illustrator Felicita Sala gives a special gift to anyone who opens this book: a secret message that ANYONE can be an artist. But the wonderful lessons don't stop there. I Don't Draw, I Color! reassures kids they don't have to do things the same way as everyone else, and it encourages them to explore their talents and find their own path to success. In a world becoming very critical and consumed by rules and structure, I really connected with the idea of celebrating difference. This is an important concept for kids to be exposed to, and award winning author Adam Lehrhaupt conveys this powerful goodness in a fun and, importantly, invisible way. My only criticism is of the boy's own criticism of his drawings at the beginning of the book. I don't believe his puppies look like mush or his cars look like lumps. In fact, I think they are marvellous! For kids aged four and up, I Don't Draw, I Color! would be a great book for schools discussing art and for encouraging children to jump in and have a go at drawing (or colouring!). Title: I Don't Draw, I Color!